Lydia Cookson was born on 18 Mar 1835 on Greenfield, Penobscot, Maine, the daughter of Abram Cookson and Sybil Witheum. Her brother Asa Cookson lived in the area until his death in 1918. The family lived for many years in Etna Maine. By 1880, they had moved to Mars Hill, Maine. Lydia died on 01 Aug 1920. B F Pierce and Maude Sylvester Benjamin Franklin Pierce b. May 1856- d. 26 Aug 1945. 1900: Mars Hill. Occupation: Dealer of General Merchandise. 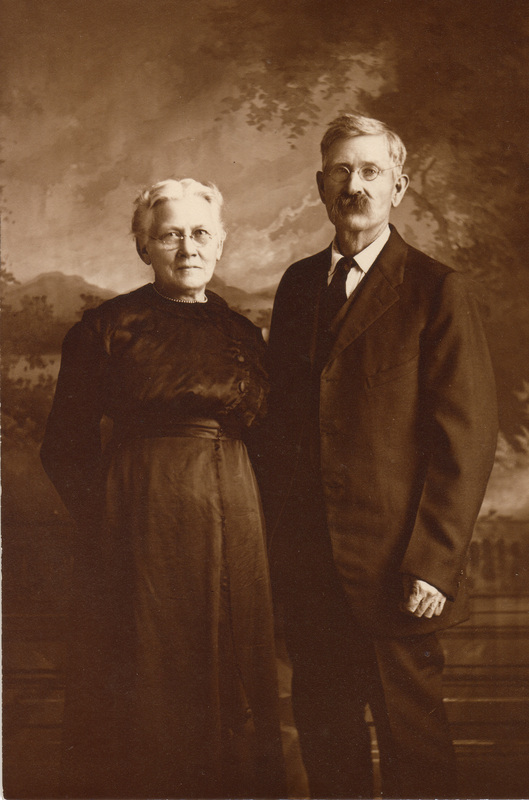 B F Pierce married Maude Sylvester, daughter of Egar Sylvester and Lydia Haskell about 1891. Rachel Blackden Sylvester was the eldest child of Napoleon Bonapart Blackden and Lydia Cookson. She was born 13 Mar 1854 in Etna Maine. She married Alden Sylvester, son of Ansel Sylvester and Louisa Torrey, on 07 Apr 1872 . 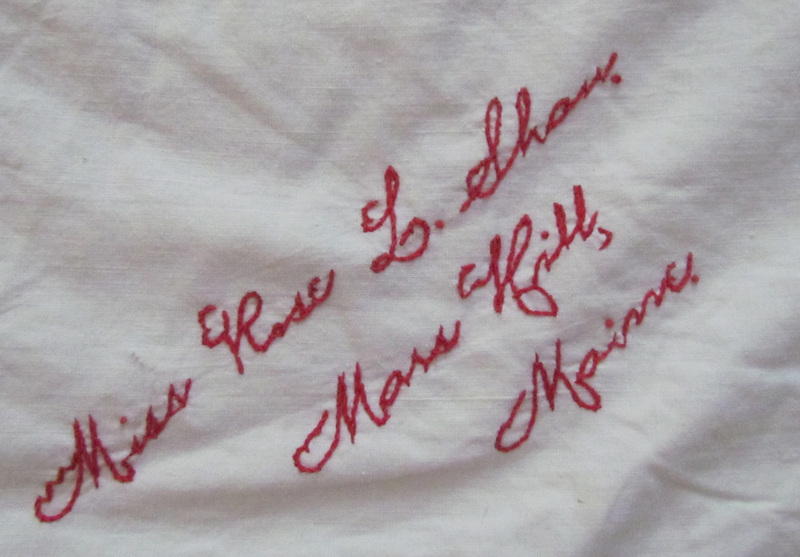 A 1897 Redwork Friendship quilt was found in Arizona at a local Goodwill store in the summer of 2012 that originated in Mars Hill and Blaine Maine. The finder contacted me, shared photos and was willing to sell it to me since it has connections to Aroostook County- the home of many of my ancestors. Some of the same family names on the quilt are also mentioned in the Robert Fulton’s Diaries. 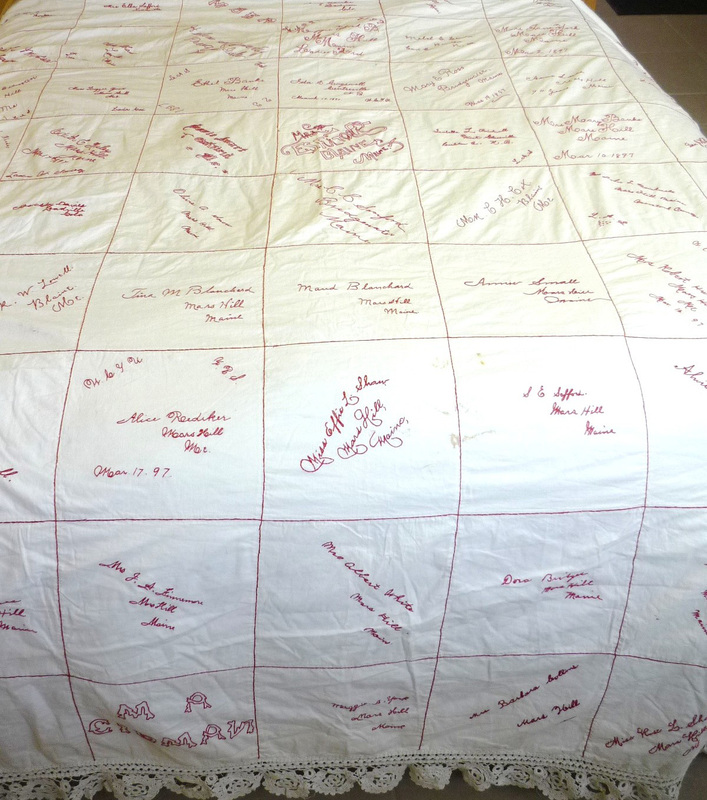 As I research each name, I will add information about those who signed the quilt. Please contact me if you have new information or photos about any of the 61 quilters. Update: The quilt has returned to its original home and is now owned by the Central Aroostook Historical Society. Mrs. Ella Safford, Leadville, Colo.
Mollie L Shaw, Lowell Mass. Melissa B Rhodes, Mars Hill, Me. Sarah S McCrea, Blaine Me. Nellie Shaw, Lowell, Mass. Loring St.
Helen Kennedy, Presque Isle, Me. Mabel E Lewin, Benton Car. Co. N.B. Ethel L Beckwith, #1 Rockdale Ave , Lowell, Mass. Mrs. C H Cox, Blaine, Me. Mrs. R W Lowell Blaine, Me. Augusta L Dudley Easton, Me. Mrs. Barbara Collins, Mars Hill, Me. Rose Lenora Shaw was born 1878, daughter of James Shaw and Sarah Dustin. Rose Shaw Shaw died on 17 Jan 1938 and is buried in Easton Maine. Jesse remarried to Lillian Adams (widow of John Bean) and was living in Presque Isle in 1940. Ruby Bridges, born August 1879, daughter of Joshua Reuben Bridges and Hannah Wood. 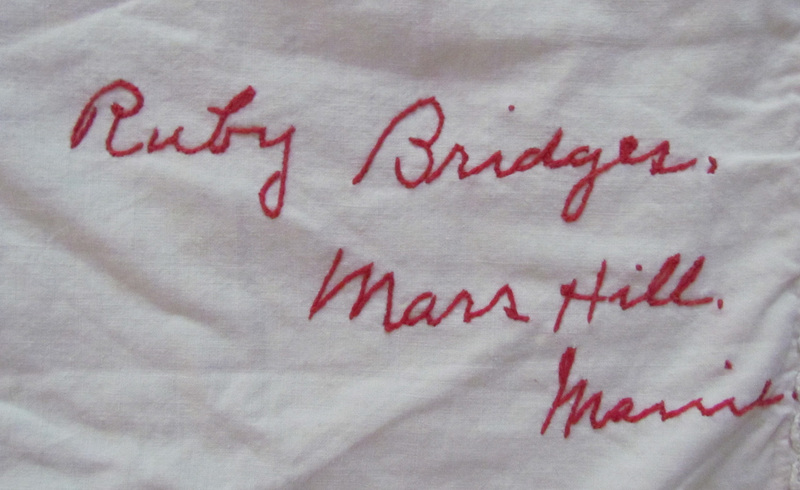 Ruby married Albert Brown, in 1898 Haverhill, Essex, Massachusetts. Albert died in 1905 in Haverhill, Essex, Massachusetts. Ruby remarried Albert Thurston Dolloff in 19 Apr 1911. She died 15 Sep 1971 and is buried in Groveland, MA. Annie R Jones, b. May 1876, daughter of Benjamin F Jones and Belinda Robinson b. Jan 1850. 1880, the family lived in Blaine Maine. 1900, Belinda was a widow living as head of household with daughters Annie R Jones and Edith P Jones, b. Feb 1884 in Houlton, Maine. Belinda also was mother of Frank W Jones, husband of Lillian Jones.